Assume the role of a renowned detective and solve a murder mystery. "This is a great Hidden Object game. I love Agatha Christie Mysteries and this game is no exception. It is a pure HO game with some other puzzles to solve to get to the end of this Whodunit." Assume the role of renowned detective Hercule Poirot seeking clues to a mysterious murder aboard a ship cruising the Nile River. 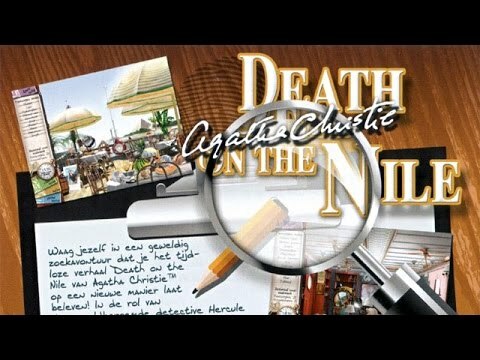 You must uncover hidden clues and evidence directly tied to the story of Agatha Christie's Death on the Nile. When you have enough evidence, question the passengers in the salon and discover the identity of the real murderer. This game is full of intrigue. I have always liked Agatha Christie and finding clues within this game is a lot of fun. They do an excellent job of giving you hints before you get too frustrated.I also loved Dead Man's Folly and 4.50 to Paddington, which are other games in the Agatha Christie series. The clues and hidden objects are clear but subtle so it provides a great challenge. I hope this review can convince you to play this game. You won't regret it! I have enjoyed the series of Agatha Christie 's hidden game for a long time. Compared with other hidden games, this game more of a classic progression through the game. The graphics are very fresh and clean looking. I can think of no better way to calm down during the day or evening than finding hidden clues. I love watching the movies but with the games I can stop and start at any time. I have had many hours of pleasure and can't wait to begin a new one. Happy customer. I have read all of Agatha Christie's books and now I can take part in the game. So far all the games on GameFools are fantastic. Keep them coming. I purchased the game years ago and was happy to see you have it. It's a fun game. I enjoy it. Good game, fun to play. Will tell my friends to play this game. A little hard to figure out than most clue games. I like harder games though. I like the Agatha Christie games -- their graphics are great and colorful. I enjoy Hidden Object games with fewer side stories sometimes.